What could you expect when coming to the Sant Mat Master Sant Thakar Singh? The first thing to expect when you met the Master of Sant Mat, Sant Thakar Singh, was that the Master always had your highest benefit in mind, in the most selfless and charitable sense. The second thing to expect was that Sant Thakar Singh would introduce you to a path of self-introspection and personal transformation whose only limit to your full benefit was the time and engagement with which you were able to apply the practice. Sant Thakar Singh taught you how to look inside yourself in quiet stillness, to focus your attention on your inner experience. He explained that this inner experience was yours; it was within you. It was an experience which was neither a result of sensory input nor produced by the mind, but rather stemmed from that eternal, highest part of you. It was the part of you called the "soul", for the most part ignored both by the physical sciences, intellectual education, and even many forms of yoga and meditation whose focus may have been on the body and mind visualization. The meditation practice that Sant Thakar Singh taught was unique in that it did not emphasize the focus on bodily and mental exercises and instead put emphasis on the personal, first-hand experience of the soul, as perceived as an inner light and an inner sound. The process of self-introspection Sant Thakar Singh taught was very practical, requiring daily engagement in order to gain prowess in stilling the mind and focusing the attention. You could expect this process of gradually gaining control of your own attention to take time. The application of a full gamut of helping factors rendered the practice more fruitful. These helping factors included a strict adherence to a healthy, lacto-vegetarian diet, the diet most conducive to meditation; service to others, also called seva; attendance at regular meditation gatherings with other students of Sant Mat; the keeping of a daily introspection diary in order to better observe and weed out imperfections of character; and the sweet remembrance of God throughout the day. Who was Sant Thakar Singh? Sant Thakar Singh taught meditation on inner light and sound or Sant Mat. His services were always free of charge and directed to seekers of all religions. For further information on Sant Thakar Singh and Sant Mat, please click on the flag. 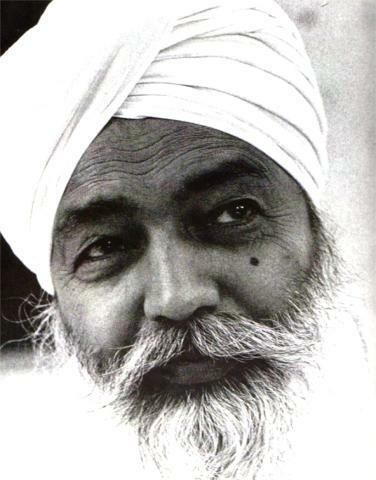 Sant Thakar Singh war ein spiritueller Lehrer. Er lehrte die Meditation auf das Innere Licht und den Inneren Ton, auch Sant Mat genannt. Sant Thakar Singh's Dienste waren immer kostenlos und richteten sich an Suchende aller Konfessionen. Für weitere Informationen über Sant Thakar Singh und Sant Mat, clicken Sie bitte auf die Fahne. Sant Thakar Singh enseñaba la meditación en la luz y sonido interiores o Sant Mat. Sus servicios siempre era gratuitos y dirigidos a los buscadores de todas las religiones. Para más información sobre Sant Thakar Singh y Sant Mat, haz clic en la bandera.